Auto Text is a way to store parts of a word document that is available for you to use in any document. In other words, with the Auto Text entries you have stored, you do not need to type same contents over and over again. But how can we use the Auto Text entries quickly? 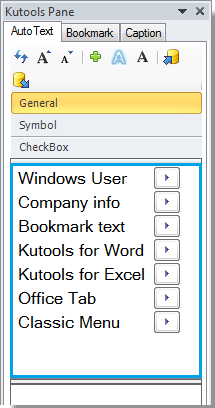 Kutools for Word’s AutoText Pane can save, list and insert autotext entries easily in document. After clicking AutoText Pane, it will display the AutoText Pane in the left side of the document as shown in the below screenshot. 1.Select the content you want to save as autotext in your document. For example, I select the following content in the document. A: Type a name for this autotext in the Name field. 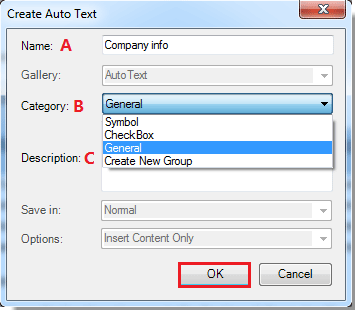 B: Select a group for the autotext or create a new group for it in Category section. C: Type words for the autotext description. 3. After the settings, please click OK to save it. Note: Besides texts, you can also add selected pictures, textboxes, and symbols and so on to save as autotext entry. 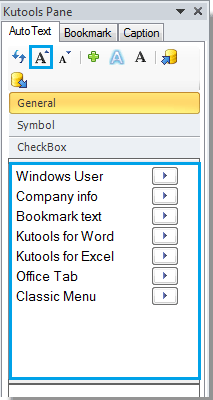 All the saved AutoText entries will be listed in the pane. 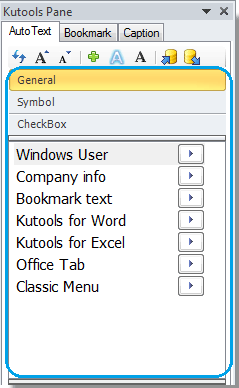 1.Double click on the AutoText entry within the pane, and it will insert the AutoText entry into the current cursor position in the document. 3. You can also click button to insert the autotext into the document where your cursor places on. 3.The AutoText entry can be inserted as formatted text or only text without formatting. Click button to insert the selected AutoText entry as formatted text. 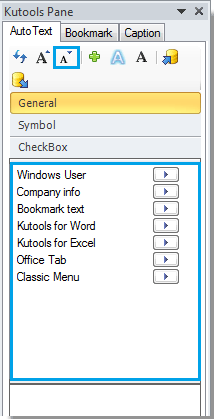 Click button to insert the selected AutoText entry as only text without formatting. 4. Besides the above three methods of inserting autotext, you can right click on any of the AutoText entry, and then select the inserting type you need from the dialog. 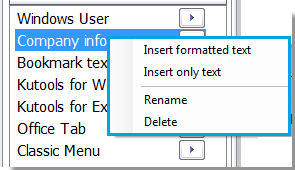 Note: In this dialog, you can Rename and Delete the autotext easily. 1.Click to import all AutoText entries. With this import utility, you can import all you saved autotext entries to any document you want. Note: Before importing autotext entries to a new document, you need to export all autotext entries from an existing document. 2.Click to export all Auto Text entries. The “Grow Font” button and the “Shrink Font” button can help you easily adjust the texts size to the ideal size you need. 1. After apply the “Grow Font” and the “Shrink Font” utility, you can see the result as show in the following screenshots.